Picture book author Cindy Jenson-Elliott writes books to show people what an amazing place the world is. 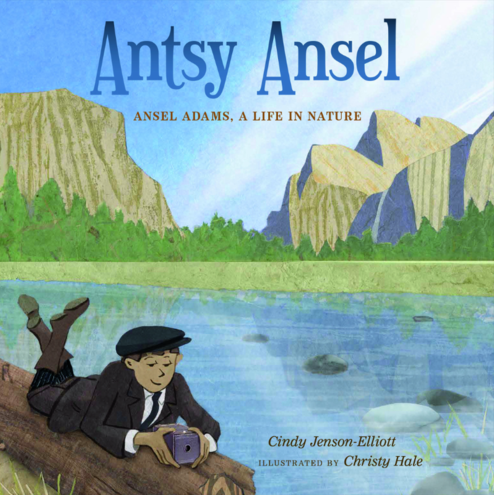 Her 17th published book is Antsy Ansel: Ansel Adams, a Life in Nature (2016), illustrated by Christy Hale, and published by Christy Ottaviano Books, an imprint of Henry Holt Publishers. “This project was …inspired by one of my most important life purposes -- getting kids outside and into nature” says Jenson-Elliott who has worked with children in outdoor settings for 20 years. It took over 30 drafts but the author says she was finally able to capture “what it felt like to be Ansel Adams,” who was kicked of school for quirky behavior and whose education came from playing outside in nature . Adam’s daughter Anne affirmed in a letter to Jenson-Elliott that the book perfectly depicts her father. Jenson-Elliott is inspired by nineteenth and early twentieth century authors' portrayals of people in relation to nature, people who are aware of the seasons and who know the names of trees, birds, and plants. Jenson-Elliott says she longs for that connection to nature in our world today. For Jenson-Elliott, her role as picture book author is to be the “finger pointing at the moon,” urging readers to notice something we may have missed. She says “the illustrator’s job is also to tell a story, a visual story – and not just to illustrate an author’s words, but to tell a part of the story the author’s words don’t capture.” For example, Jenson-Elliott says that in her book Weeds Find A Way the illustrator Carolyn Fisher tells “a visual story of a girl and her dog discovering weeds" and that this story exists as a parallel one to Jenson-Elliott’s poetry. “It would never have occurred to me to put in characters” says Jenson-Elliott, “but it made the narrative come to life.” She says the editor is the expert who sees the whole picture and who pairs the author’s words with an illustrator’s art to tell a parallel story in a beautiful way. Jenson-Elliott holds a master's degree from the College of Education at San Diego State University. She says the best way to support children’s authors and illustrators is to emphasize for teachers in training the many creative ways authors explore nonfiction topics. She recommends inviting authors and illustrators for paid classroom visits because this helps students understand the authentic creative process. Why paid? "Because," she says, "We need to understand that artists -- including the art of the written word -- need to be able to make a living." 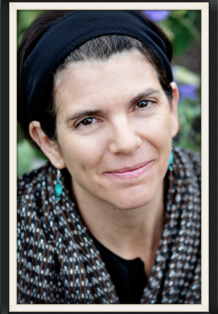 Her advice for aspiring children’s book authors is to “read a lot…for enjoyment and again to study craft and to join SCBWI -- the Society of Children's Book Writers and Illustrators.” She recommends a broad liberal arts education, remaining curious, and reading and writing constantly. Thanks to Cindy Jenson-Elliott for the interview and thank you for reading.